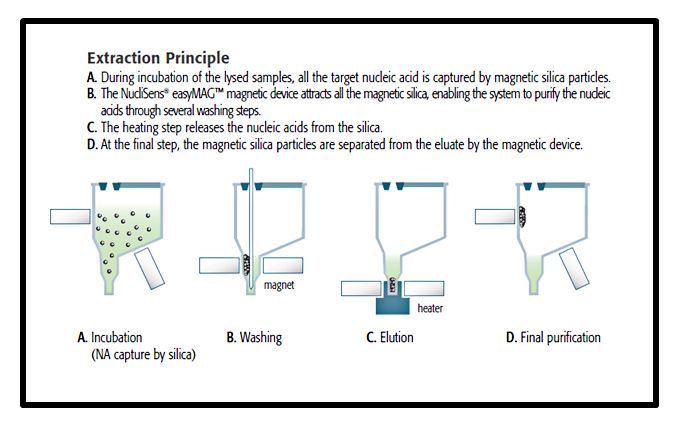 NUCLISENS® EASYMAG® is a breakthrough automated platform specifically optimized for total nucleic acid extraction. NUCLISENS® EASYMAG® instrument is designed to meet the most critical needs when it comes to premium quality total nucleic acid extraction. 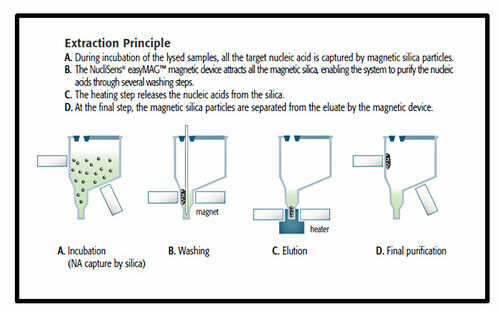 The system automates an enhanced magnetic silica version of BOOM technology, a gold standard for efficient universal extraction of RNA and DNA. Purity and quality are assured with critical safeguards. What’s more, the system offers ease-of use and optimal workflow for enhance productivity. NUCLISENS® EASYMAG® is an award-winning automated benchtop nucleic acid extraction system that stands out for its versatility and flexibility. Its exceptionally robust design means the entire BOOM® extraction and purification process takes place in a single well and only one aspiration tip is required per sample. This simplified operation dramatically increases the reliability of the procedure. BOOM technology, first patented by bioMérieux, is a gold standard for the universal extraction of RNA and DNA. It’s our in-house expertise of this technology that sets our extraction chemistry apart. Based on the ability of silica to bind DNA and RNA in high salt concentrations, BOOM’s leading performance is recognized in a number of papers and comparative evaluations*. *For example, Rutjes et al. showed that with the miniMAG “RNA levels increased at least 100 to 500 times” (Rutjes et al. , AEM,(71), 7, 2005, pp 3734-3740). Tang et al. showed that “miniMAG produced the highest quantity of nucleic acids and the best precision amongst the three systems [tested]”. (Tang et al., JCM, (43), 9, 2005, pp4830-4833). NUCLISENS® EASYMAG®’s compact, ergonomic design means it easily fits in virtually any lab. 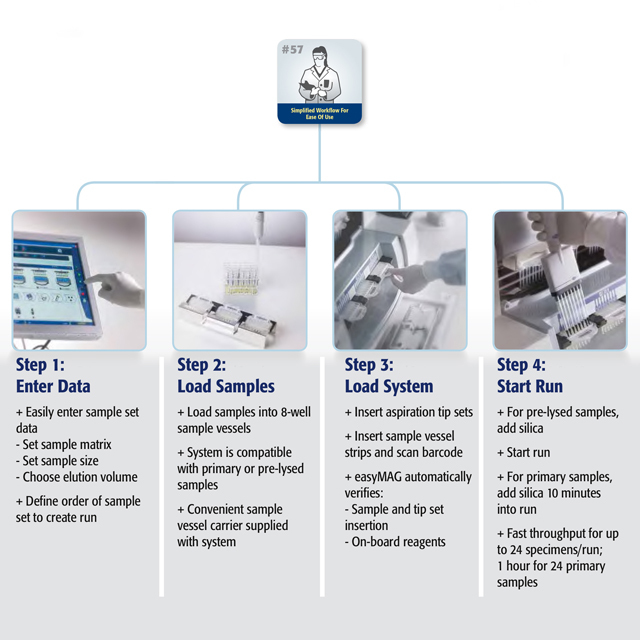 On-board reagents and a smart design for disposables help minimize hands-on time and streamline workflow. 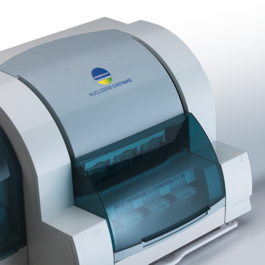 NUCLISENS® EASYMAG®’s intuitive, icon-based touch screen interface lets lab personnel quickly and easily set up, operate and validate sample runs. Easily connect to your LIS for automated data transfer with NUCLISENTRAL®.